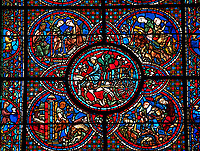 Pictures & Photos of Chartres Cathedral, France. 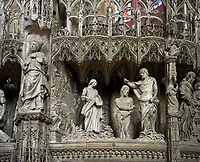 Pictures and Photos of the Medieval Gothic Cathedral of Notre Dame, Chartres France and its Medieval Gothic art and sculptures. One of the great Gothic Cathedrals of the Christian world is Chartres Cathedral which was constructed in 1194. Nearly 1000 years later almost all of the original stained glass windows and sculptures survive in this wonderful Gothic masterpiece. The design of Chartres is uncompromisingly Gothic. With it early use of flying buttresses, huge rose windows, pointed arched windows and a naive that soars to the heavens, there can be no mistaking Chartres as a signature gothic building. After a fire damaged the previous cathedral in 1194, construction started on the present building. The Cathedral was built quickly over 26 years and has a coherence in its design that does not suffer from the endless alterations that other Gothic Cathedrals built over many decades suffer from. The vast nave, in pure ogival style, rises to quadripartite stone vaulting. The three entrance porches are adorned with fine gothic sculptures from the middle of the 12th century, and the 167 magnificent 12th- and 13th-century stained-glass windows, all in remarkable condition, combine to make it a masterpiece. Today Chartres is like a fairy tale that cannot help to impress even the modern eye so it is impossible to imagine the impact that the cathedral would have had on medieval pilgrims, most of whom would only have ever seen single story wood buildings and small local chapels. The Medieval Roman Catholic church was all powerful in the Middle ages and the Kings of Europe bowed to the Pope in Rome. To impress to the fact of its all encompassing power the Catholic Church eagerly embraced the Gothic style. New building techniques allowed the Cathedrals like Chartres to tower above towns and castles and were visible from miles away by the peasants toiling in the fields. The Gothic cathedral was the ultimate statement of Catholic supremacy and many of the Medieval cathedrals of northern Europe can still be seen long before a town or city is reached. 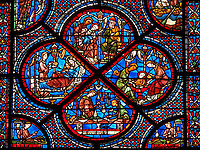 The stained glass windows and medieval sculptures of Chartres also demonstrate that the non ecclesiastical medieval man understood the stories of the bible and Saints through visual narratives. The liturgy of the Catholic church was in Latin so even if the average medieval man had been literate, which he was not, he could not have read the bible and understood it. 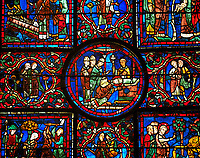 It is striking in Chartres the lack of the written word in any of the stained glass windows or below any of the statues, which means that medieval man was so well versed with the narratives depicted in the scenes in the stained glass windows of Chartres that he had no problem understanding them. Each stained glass window is made up of geometric panels that depict a scene from an events or lives of the characters the window is dedicated to.